The Rule of Law is one of the most important elements of a liberal democracy. It should not be thrown overboard to promote a populist, jingoistic line. One of the great ironies of Australia is that it is a country whose first European settlers were convicts — and it now makes good character a prerequisite for new settlers. What if in 1788, the Eora nation had used a character test? Section 501 of the Migration Act is one of the most powerful provisions in our migration law. 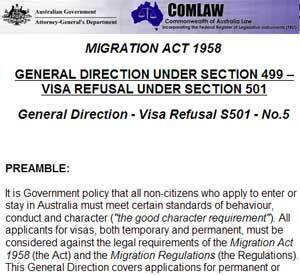 It gives the Immigration Minister the power to refuse or cancel a visa on the basis of a person's character. This decision can be made personally by the Minister or by the Minister's delegate. A decision by the Minister means no right of merits review, only the limited grounds of judicial review. Dr Mohammed Haneef has experienced the worst case scenario — a visa personally cancelled by the Minister, without the provision for natural justice, on the basis of non-disclosable information. Such power should be restricted to the worst cases, not used to overcome the decision of a magistrate to release on bail someone accused of serious offences. If a person is sentenced to 12 months or more in prison, then they fail the test and must rely on the discretionary powers of the minister or his delegate not to have their visa refused or cancelled. 'Character' is not limited to criminal convictions, but can include any conduct, even when only alleged. The three primary discretionary factors are the protection of the Australian community, the expectations of the Australian community, and the best interests of any children. There are a number of secondary factors but unless an individual can convince the decision maker on at least one of these factors, their visa is likely gone. One of the strongest powers available in this area is to make a decision without providing 'natural justice'. This is usually understood to mean that a person has the opportunity to know the accusations against them and to comment on the accusations. 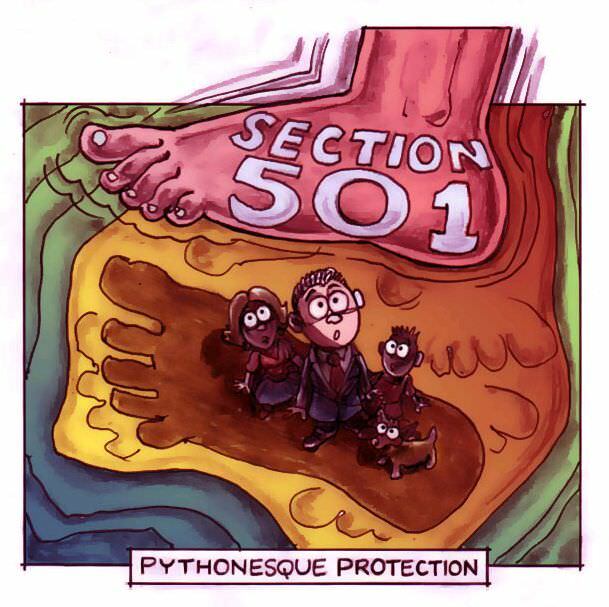 Section 503A of the Migration Act provides the power to refuse to disclose accusations, or even the source of the hidden information. This means an individual can face the threat of cancellation or refusal of a visa, be given the opportunity to comment on this, but not be told what is the information against them. This has resulted in a number of 'pythonesque' cases where people are told, essentially, "You fail the character test, please respond, but we cannot tell you what are the accusations again you". There may be good policy reasons why people who have engaged in unacceptable conduct should not be able to live in Australia, but at least they should have the chance to reply to accusations against them. In his decision in the case of Dr Haneef, Kevin Andrews stated that the Australian community would expect the visa to be cancelled when someone had an association with or provided assistance to persons suspected of involvement in an act of terrorism. One wonders how accurate the secret information is, and whether the Minister was properly informed. His defence is that he has more information than the Australian Federal Police (AFP) gave to the Court. So the question becomes why didn't the AFP see fit to present this secret information to the Court, but only to the Minister? On ABC's Lateline, the Attorney General seemed to imply that a presumption against bail should be interpreted as no bail at all, a curious understanding of the legal meaning of 'presumption'. The Opposition has been quiet on what is really a serious challenge to the rule of law and the importance of the court's decisions not being trumped by Ministerial fiat. A number of years ago, the separation of powers had to be explained to a former premier. Perhaps current politicians need lessons as well? Some would say that because we live in a new age of terrorist threats, extreme measures are needed to protect our democracy from those who want to destroy our way of life. But what sort of democracy are we protecting when an accused person can lose their liberty on the basis of accusations which are untested, and be given no chance to put their case before they are locked up? It is not disputed that the government should be able to exclude people who have, by their extreme conduct, made their presence in Australia intolerable. 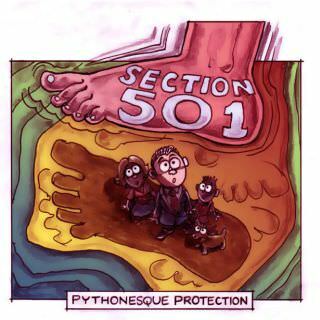 However such cases are rare and the power of Section 501 should not be abused by using it in cases where it is clearly not warranted. It should not be used as an alternative to the rule of law. Section 501 can be compared well with Franz Kafka's "The trial"
Josef K. is never told what he is on trial for, and he maintains his innocence almost to the end. Upon declaring his innocence, he is immediately questioned "innocent of what?" Does that not strike a recognisable chord with recent news of Dr Haneef's treatment? Ministers Ruddock and Andrews do not seem to realise how accurately their actions mimic that prewar German novelist's depiction of bureaucratic absurdity in aid of complete loss of democratic freedoms. The next step would be to institute full-scale "disappearances" into reality, rather than just the 14-day (subject to extension) periods of isolated interrogation allowed today. Jim, I could not agree more. Kafka's Trial to a Tee. Will Joseph K see the light of day in this instance...it is beginning to look likely. When the majority support a Right Wing government, they also accept the sound of Jackboots on the pavement. Nothing will be done except tut tut, and everything will be whitewashed back to normal by the media, except that nothing will ever be normal again. Time for Aussies to wake up, go solar and begin looking after each other instead of exploiting our planet and "cheap labor". I wonder how Australia would feel if the Iraqis and Afghans decided we were of bad character for invading their nations, bombing nearly 1 million civilians to bits, destroying their homes, water, electricity and all without reason or invitation. We make many criminals in this country and just wear it. Dr Haneef has not managed to even clock up a speeding ticket or parking fine across three continents so why Andrews says he is of bad character is beyond me but the man is a clown as Laurie Oakes so brutally points out in the Bulletin. As for the secret information - the only secret was that no-one in England wanted the boy arrested and the DPP here knew he should not have been charged. Now they are doing a Bakhtiyari on the boy, Kerry is well aware of how a Bakhtiyari works. With hindsight, it can be added that the Howard Administration is behind us. However, Australia’s good name, as a responsible, benevolent and humanitarian nation has been besmirched around the world. I understand that most of the persons responsible for this continue to draw parliamentary pensions. Mr Andrews, God love him, continues to augment his pension as seat-warmer for the good burghers of Menzies, Vic.